Equipment footprint is 100” wide (load side) x 220” deep with a 170” swing height. Unit features stainless steel product contact surfaces. Unit rotates, docking pour hood mounted slide gate to stationary hopper at 70” above floor level. Stainless steel hopper includes a rigid, stainless steel, horizontal screw conveyor for controlled discharge of product. Hopper features an inlet valve with level sensors to facilitate automatic mode operation. 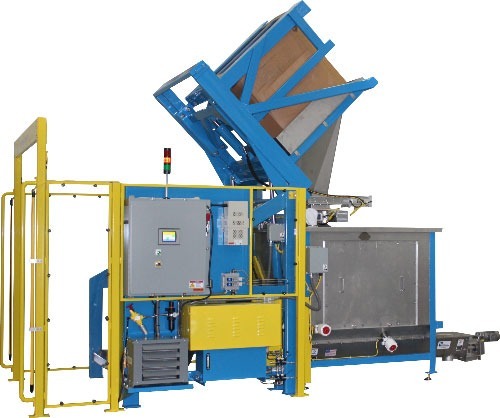 Safety features include two (2) sides of acrylic machine guarding and a light curtain on load side of unit. Hydraulic thermal heat exchanger to prevent and protect system from overheating. Hydraulic system includes a “Zero-Pressure” feature which “de-energizes” equipment during maintenance by returning residual cylinder pressure back to reservoir. NEMA 4 carbon steel Hoffman brand electrical enclosure with Allen-Bradley touch-screen operator interface and PLC system for auto-mode operation.